We're up and about at the crack of midday. My head says we've burnt too much of a precious outdoor day but I'm coming to terms with the irrelevance of time in this place. The sense of urgency I brought from home is starting to look like dead weight. 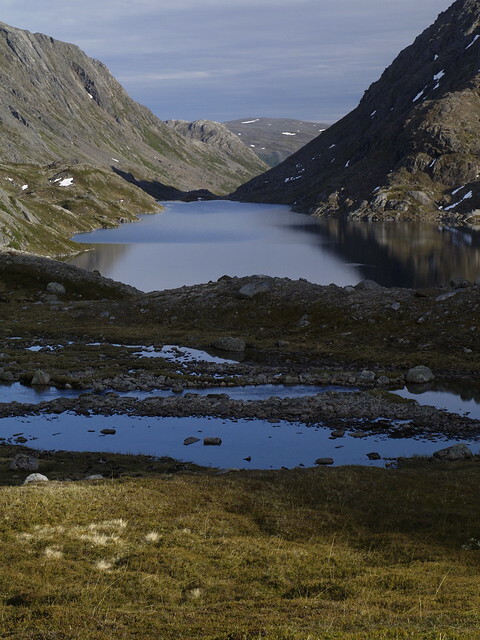 As I sit and munch muesli I cast my eye over the Gressnesfjellet yet again. Ever since we started our descent from the pass to this fantastic pitch I've been wondering what's on the other side of the rise. The map tells me that a fantastic water-filled mountain valley is tucked in behind the rocky barrier but is the grass really greener? Today we should find out. Today the sky is clear. Today the tops are bathed in crisp cool light. Waiting a day was the right tactic. Waiting a day is something I wouldn't have done in different company. 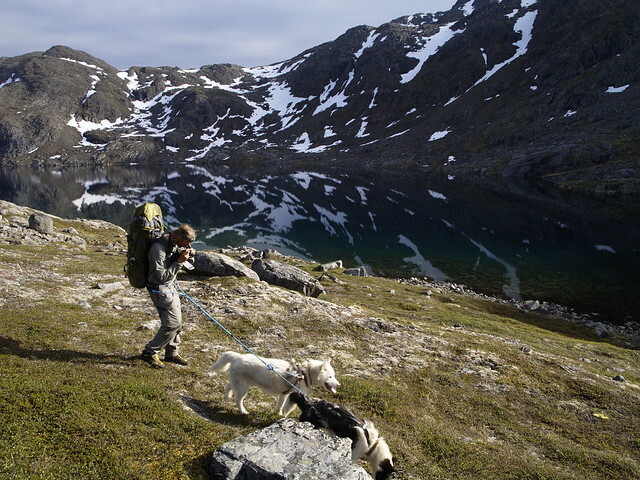 The intention is to cross over into the valley system running along the western side of Suolorassa, climb up another ladder of lakes and then wind our way back North along the red dashed line of the recommended route via the Ovrevatnet to find a last camp at a suitable jump off point for the boat. If we break the back of the walk out today it will leave us with just an easy stroll to the car. By the time we're packed up and moving off my watch is saying two in the afternoon and I'm expecting to burn the last of our midnight oil before we make camp. 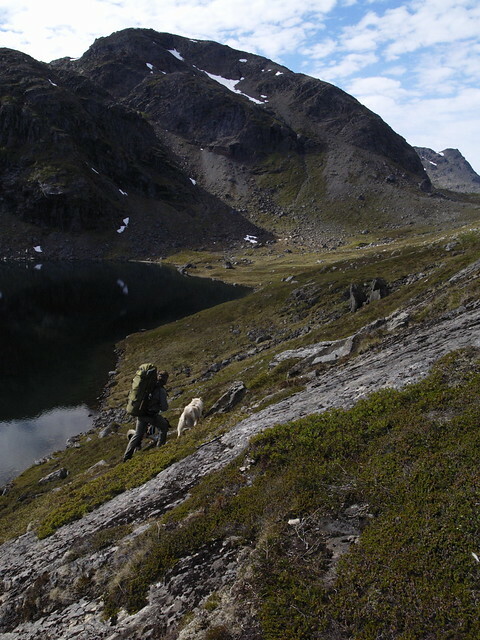 It's a sharp but short climb up onto the broad ridge separating the Guicavakkejavri from the Voulit Guhkesjavri. Warm in just a baselayer I take the climb slowly never missing an opportunity to look back at the lake shore home we've just left. 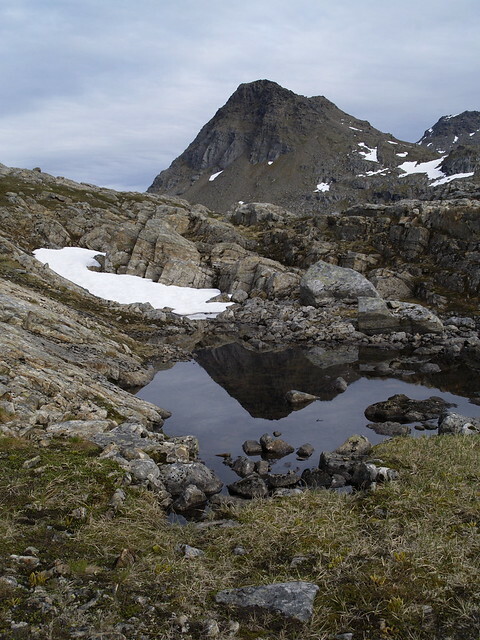 The little tarn is right in the saddle where the map says it should be. It's prettier than the map suggests. Just a shallow scoop but its mirror glass surface is coated with sea-deep reflections. We shamble across the flat and, just as I have to let go of the view behind, the view in front opens up. There follows one of those moments of affirmation. Before me, all around me, lies the answer to the question “why do I do this?”. The question I ask invariably when weather or terrain or joints or mood or all four are against me. The answer I find invariably elsewhere, in the warm, dry well fedness of return or in moments like these. Moments sometimes fleeting but thankfully recurring. Moments where the majesty of these wild places cuts through to my core. Today the Vuolit Guicavakkerjavri, hemmed in by steep rock and scree, is picture postcard. On another day this would have just been another mountain lake but it's not just a question of place. It's about time and place. I'm uniquely privileged to be here and now. A beaming Randulf passes comment on the surroundings. It strikes me that his enthusiasm borders on the miraculous. As much as I love the outdoors getting back home and washing it off my skin remains equally pleasurable. This place is Randulfs office, his everyday, his bread and butter, and he's still blown away by it all. We move slowly on traversing, sometimes on a steep slope, around the lake. Pausing to take photographs. Pausing just to stand and gorp. It's an improbably beautiful scene. The lake is a patchwork of mirror and ripple, patches of troubled surface betraying the complex pattern of down draft and local wind that flows around the intricate topography of its shores. 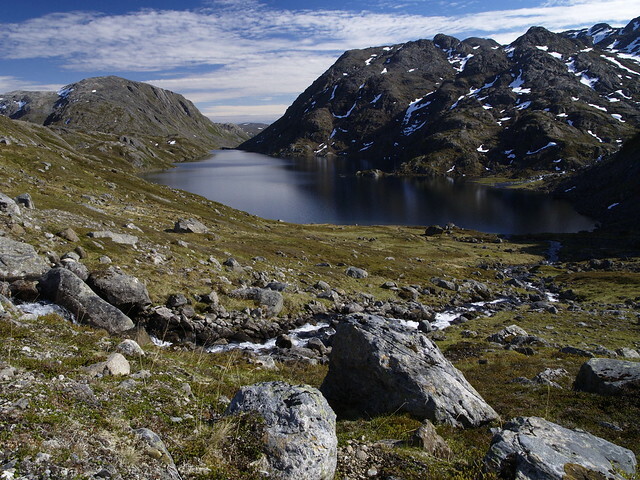 The southern end narrows dramatically and hangs, levitating in the notch between the Gressnesfjellet and the Kastarfjellet. A fast flowing stream runs into its Northern end to replenish whatever runs over the southern edge. We turn our backs to the lake and climb along the stream. 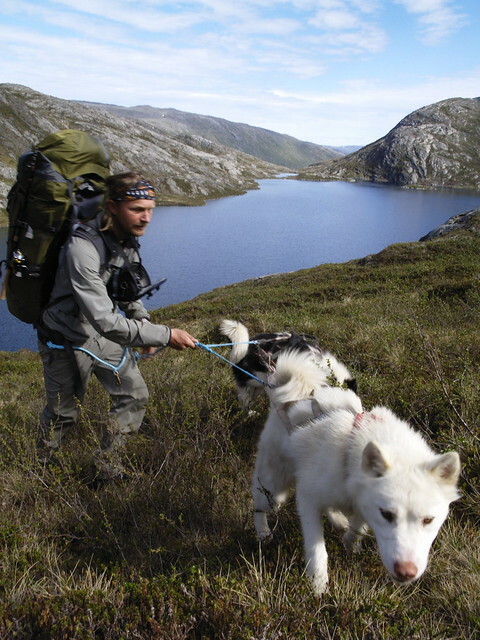 Randulf takes me by surprise once more suggesting that we take a break. It's only an hour and half since we broke camp and we've covered just a kilometer as the crow flies. We've scratched the surface of what is set to be the longest day so far but we're in the golden moment of this trip. Randulf reasons that the moment is too good to waste. We should stay right here and mine some more gold before moving on. We go with the impulse, park the dogs, dump the packs, take out cameras and just idle around enjoying the moment. In fact we stay so long we're in need of a meal and a brew before we move on. The rest of the day follows in the same vein. More perfect day. More lakes, seethrough in the shallows, as reflective as polished silver where deep. We thread our way up along two more kilometres of the valley suntil the next urge to stop takes over us. 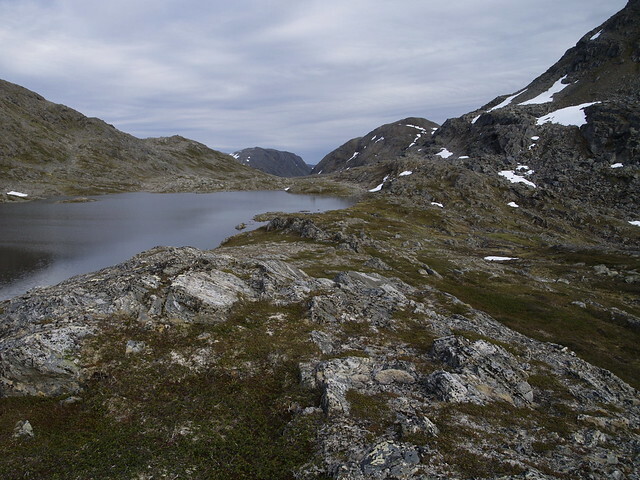 Another lake, unnamed and two hundred meters higher up the chain, looks like the perfect camp but if we stop here we'll still have a long walk out tomorrow. If need be we have enough food for an extra night but it won't make for an exciting meal. It's just 5:30 and three and half easy hours since we set out. We decide to stay put and to hell with the consequences. The rest of the evening is spent relaxing. Our unnamed lake gives us a grandstand view of a gnarly unnamed peak. Fishing doesn't yield fish but we have a good fire courtesy of a collapsed reindeer fence. The sky stays clear and it looks like the night will be a fair one. There's next to no insect activity so I suggest we forgo setting up the tent. After three sunlit nights and sweltering mornings in a tent the idea of sleeping under the stars and waking in the fresh air carries a strong appeal. So, deal done, we mill around some more and when the time comes roll out the bags and lie down. Simple. Just like nature meant for us I think to myself. Then comes the rain. Maz, Thanks. Not such a radical change I don't think but it works for me. Alan, Thanks too. In your case just returning a favour. Dave, I really enjoy your writing and look forward to every instalment. It's true. The confines of the 8 hour work day and 7 day week are incompatible with mountain time. Best to leave them at the trailhead. Joe, Glad you get something from these scribblings. Even when the sun rises and sets I find my need for schedules and plans dictates what I do. It takes me a while to get into a rythm more in keeping with the activity. Ronald Turnbull advocates walking without a watch and I never realy got his point until quite recently. Unfortunately many of my trips aren't of long enough duration to realy find nirvana. When the day's are endless the freedom to do what you what when you want to is quite liberating. My companion was well into the swing of the solar day by the time I landed so was able to impose some anti-discipline on the proceedings. After the first day or so I let go of everything other than the fear of being 12 hours out of synch on my first day back at work. One of the saddest moments is 0900 on a monday after a long trek. After a weekend, it's hard enough to stroll into work with a smile on your face - after a long trek, it's almost impossible. There are days when I wonder whether it's possible to make a living out of doing what you love or whether, in reality, the constraints society imposes on us are too strong to truly break free of. You need a stable income to support yourself and the outdoors, wonderful as it is, will not necessarily provide that to everyone - it's a bit like the creative and artistic pursuits in that way. I am always impressed by people - like Henrik Raßmann who has opened a new European UL online store - who try to make a living out of his passion. It's risky but sometimes, life is in need of a bit of risk! Maz: I can see the romance in making a living out of something for which you have a passion, I bow deeply to those who manage to do so, but I can also see the downside. My Seiland Buddy makes a good living out of the outdoors but I realy mean it when I say I think his continued enthusiasm is a mirracle. For me there would be a real danger that the passion gets lost in comittments, deadlines and all the other things that go with common or garden jobs. I'm happy to have a good job which gives me the means and the freedom to pursue the outdoors as a (relatively all consuming) hobby. Keep it special, you mean...? I can see the logic in that but I suppose it very much depends on the job you have at the time. Anyway, thanks for your continued comments on my own journal - I like your writing style so it's nice to have you comment on mine. Gina thanks! I just take lots to increase the odds. Glad you like them.